Quiz: What the *$&! Is this malware? What the *$&! Is this malware? 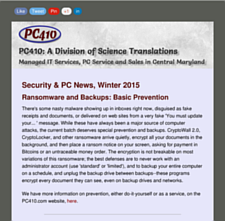 The best defense against malware infections is knowing what’s going on around you. Knowing when to cross the street, turn and run, get out of a bad neighborhood, and so on. Just like any other danger–when in doubt, go somewhere else. For each of the samples, try to identify what kind of annoyance it is. Some are just advertising, some are deception to the point of fraud, some are dangerous to click on, and some are just plain nasty. Need to learn more to protect your business and educate your staff? 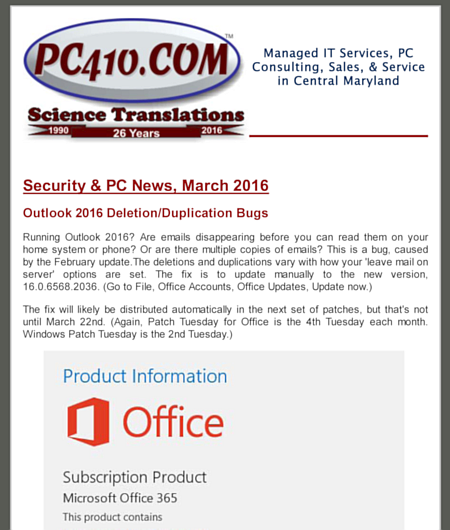 The PC410 Newsletter is for business users of computers. For busy people, it’s short. It’s free. It’s monthly. It tells you what’s happening in computer security, without Technobabble. The usual big hint applies: Click on ‘Hint’ for definitions. Scam for fake technical support. It's a Virus Warning! from Microsoft!! Rogue antivirus product, called 'Security Essentials'. Adware, and it's showing off the first of a series of ads. It’s a scam. Once you call that number, the overseas tech support, claiming to be “the tech support for windows” will tell you (and everyone else) that your computer is infected, will show you settings screens that look scary, and will try to take your money for installing free software that does nothing. Most of these ‘techs’ will ask you to visit a website that will allow them to remote into your computer for the repair–those sites might be evil, or may be free remote services that are being abused, so don’t assume that the website you’re sent to is the company doing the remote “service”. 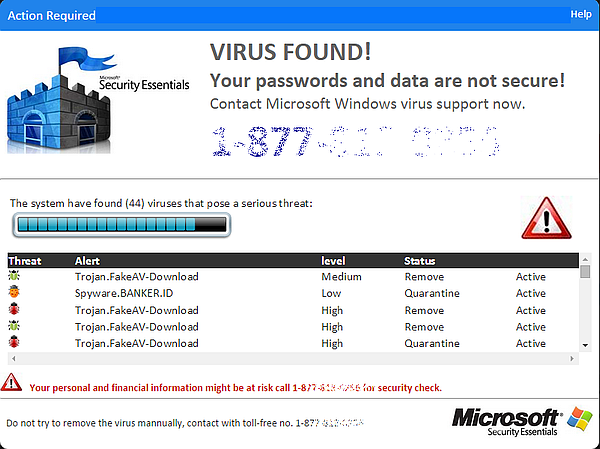 ‘Microsoft Security Essentials’ is a legitimate Microsoft product whose trademark is being abused in the scam. The product is real, but it doesn’t look like the picture. It is reasonable protection for users who keep all patches up-to-date and only use a non-Admin Windows account. High-risk web surfers and admins should choose a more powerful security product. There is no such thing as the ‘best’ security product, or one that will work for every user. Virus warnings should match the security product installed on your computer. Tech support scams offer a phone number to call for tech support that leads to offers of $300 repairs, where nothing actually gets fixed. A rogue security product is software that tries to scare users into purchasing software that does nothing. Adware shows ads for products related to your search history. Extra hint: This product installed itself during another product’s install, and showed these results on a new, clean installation of Windows. Malware installer. It's taking over your computer. Probably done by the time you see this. It's a FUD Attack! Fear, Uncertainty, and Doubt used as a remote-tech support scam. Rogue, fake product, with fictional "threats" that don't actually exist. Spyware. It's phoning home with the contents of your wallet. While this message shows a phone number to call for ‘Expert Tech Support’, it’s a rogue security product showing fake alerts. Maybe the product can do something legit, but it’s impossible to tell when it auto-installs as a bundle on a download site, matched with a completely-unrelated product. At best, it’s a PUP, a Potentially-Unwanted-Program, and there’s no reason to trust or purchase security software that arrives as a wrapper-based download. Rogue! Scoundrel! Infamous Wretch! It's malicious! Malware! Malware, we say! Evil! EVIL!! 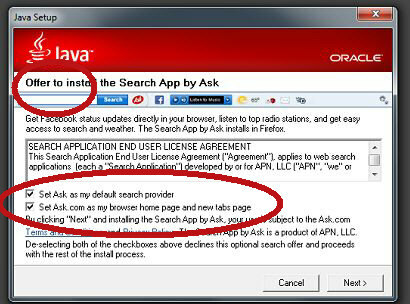 This is a drive-by download of the ASK Toolbar. It's a puppy. No, maybe it's a PUP installer of a toolbar. This is a PUP installer. PUP is a lawyer-written acronym, meaning a Potentially Unwanted Program. This particular PUP is the ASK Toolbar, which claims to do various things, but in reality, it just slows down computers, adds to boot time, and slows down browser startup. Just say no. While it is not evil or malicious, it also isn’t useful in any way. The screen shown is from the installation of an update for Oracle’s Java. Java is a programming language, designed for appliances, which has been adapted for use online–as a result, it has its own set of security flaws, requires frequent updates, and is used by only a small percentage of the online population. If you don’t know you need it, uninstall it, so there’s one less thing to patch every month. It’s mostly used for hardware access from web pages, such as internet speed tests, and running check deposit scanners. Normal web surfing doesn’t need it. Drive-by Downloads use various tricks and security holes to install software on computers that visit a page hosting them, without asking permission. Prevent them with anti-malware software, using only limited accounts that cannot install software silently, and keeping all patches and updates up-to-date. Toolbars offer extra browser features. They deliver slowdowns to boot time, browser startup, and damage overall reliability. Hint: This malware hits multiple categories. And the product name at the stop is the name of the download that the other products are riding into town on. This multi-factored mess includes Spigot, Shopping Helper, Slick Savings, and more. It's a good thing. It will save me money on shopping! Yippeee! This is a trojan horse. (Beware wooden horses big enough to hide an army.) It says it will install browser extensions, but it's really hidden spyware. It's the install screen for a PUP, with multiple toolbar installs, search redirectors, and search hijackers. This is a video downloader program. This is half an hour of cleanup by a tech, if you let it into your computer. It’s multiple toolbars, search hijackers, and search hijackers, integrated into Internet Explorer, Chrome, and Firefox. Each browser it touches will slow down, and crash. 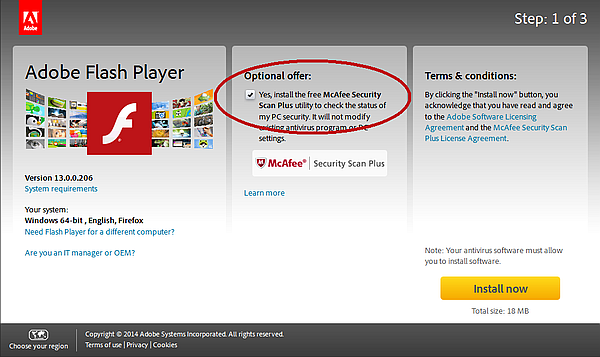 Adobe Flash usually features McAfee Security Scan Plus, but other products show up in this space as well. Spyware! It reports back to home base, with a list of web sites you shouldn't have visited. Drive-by download! Must be that; no one ever remembers installing it. It's a PUP, a potentially-unwanted-program that exists to serve advertising for McAfee products. It's a Search hijacker. It sends searches home and changes the results to sites that are paying advertising fees. This is a worthless PUP, or Potentially-Unwanted-Program. While it claims to be a security product, it isn’t. It’s advertising for McAfee products, and it does nothing. This one isn’t evil, or malicious, or useful in any way, and it can be easily uninstalled from the Windows Control Panel. While it says it can find security threats, it can’t remove them, doesn’t update itself to detect new threats, and if has ever identified anything that should be removed, it hasn’t been reported back to the security community. Uninstall it, or better, uncheck that ‘yes’ box and don’t let it clutter up Windows.